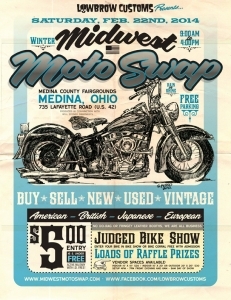 Event Description The Winter Midwest Moto Swap is coming up on Saturday, February 22nd, 2014 in Medina, Ohio. This event is getting bigger and better each time, with well over 100 vendors selling vintage motorcycle parts and accessories, tech seminars, music, good food & good times, all for a $5 entry fee! And don't forget the judged bike show, free to enter with your $5 entry fee! Check out www.midwestmotoswap.com or www.facebook.com/lowbrowcustoms for all details. See you there!